Who cares what the weather is doing out there. You can make smokey, tender, juicy, meaty Instant Pot Baby Back Ribs indoors, in any weather, in about an hour! 1 cup BBQ Sauce I like to use one with a smoky flavor. Put a trivet in the inner pot of your IP. Add the water or juice, liquid smoke, and ACV to the inner pot. Press the Sauté button to start warming up the water. Lay out the rack of ribs, meaty side down, on a baking sheet. Remove the thin membrane (also called silver skin, if it's still on there) by grasping it with your bare hands, or a paper towel, and pulling down the length of the rack. It should come off pretty easily. Sprinkle dry spice rub liberally over the ribs and gently rub it in. Flip the rack over and do the same to the other side. Carefully roll the rack into a "C" shape and put it in the pot sideways (the meaty side will face the outside of the pot. You can also cut the rack into a few pieces and stack it in the pot. Put the lid on the IP and close it, turning the venting knob to the Sealing position. Cancel the sauté mode. Press the Pressure Cook (Manual) button or dial, and then the +/- button or dial to choose 25 minutes. The IP will take a few minutes to come to pressure, and will begin the cook time when pressure is reached. After cook time ends, and the unit beeps, just leave it alone as it will enter the NPR, or Natural Pressure Release phase. The display time will begin counting up. Let it NPR for 10 minutes. Then use a wood spoon or something to carefully turn the knob to venting and release the rest of the pressure until the pin drops, indicating it is safe to open the lid. Remove the rack of ribs using tongs, and place on a baking sheet. OPTIONAL: Turn your oven to BROIL at 400 degrees and set the oven rack about 8-10 inches from element. If it is hot in the kitchen I don't do this step, but on a cool day I don't mind the oven being on for a few minutes. 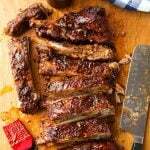 Pour your BBQ sauce on the hot ribs and use a brush or a spatula to cover them completely and generously. Put the pan under the broiler for a few minutes, until the sauce gets bubbly. Be careful not to leave them in there too long as they might dry out. No one wants dry ribs! Enjoy!